Croatia's electorate prepares to vote for the second time in less than a year in the country's national parliamentary elections on September 11, 2016. The flames of the ultra-nationalism stoked by politicians from the Croatian Democratic Union (HDZ) provide a welcome distraction from the country's economic woes and rampant political corruption. 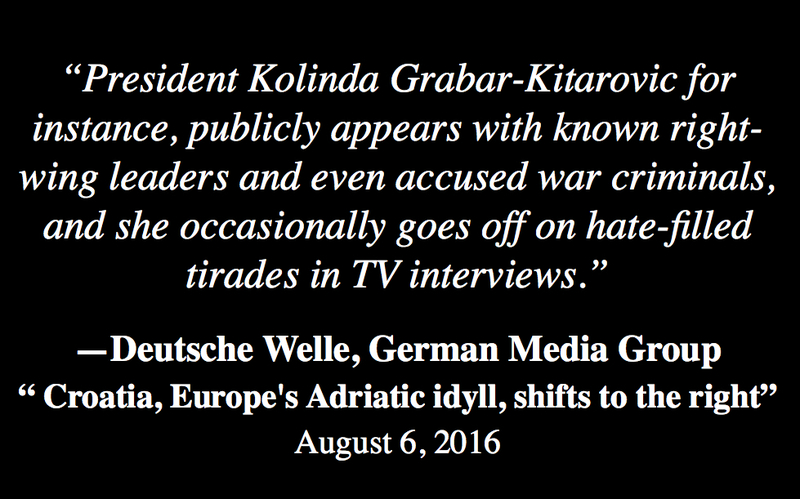 According to Deutsche Welle, "President Kolinda Grabar-Kitarovic, for instance, publicly appears with known right-wing leaders and even accused war criminals, and she occasionally goes off on hate-filled tirades in TV interviews. She only distances herself from extremists when foreign pressure leaves her no other option." 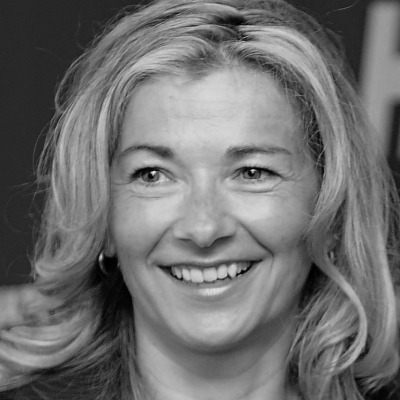 As an early member of HDZ, Grabar-Kitarovic used HDZ 's infrastructure, donors and voters to run for Croatia's presidency. She solemnly promised to continue the legacy of President Tudjman, an authoritarian ruler who proudly promoted and successfully executed the idea of having 200 Croatia's families own the entire economy. Croatia's citizens have yet to see the courts deliver a conviction in a high-level corruption case. A courageous judge Ivana Calic found Ivo Sanader and the HDZ leadership guilty, condemning the HDZ political party as a criminal enterprise. However, a politically influenced judiciary freed Ivo Sanader, a former prime minister who was found guilty of stealing taxpayer funds with the aid of HDZ senior leadership and the party's political structure. HDZ has failed to purge corrupt officials from within; the few new faces are used as decorative pieces to bait a disappointed electorate and distract from other controversial figures. Among them is Zlatan (Zlatko) Hasanbegovic, known for denying the genocidal character of the Ustasha regime which collaborated with Nazis during WWII in then-Croatia, taking photos while carrying pro-nazi signs, and publicly praising Nazi Imam of WWII SS troops as a reformer. Hasanbegovic, a former minister of culture, appears again on the HDZ's parliamentarian list in Sunday's elections. In fact, a few months ago, Zlatan Hasanbegovic was considered a potential candidate for HDZ's presidency. The world's leading think tanks and advocacy groups opposing the rise of anti-Semitism in Croatia had called for the resignation of HDZ politician Hasanbegovic. 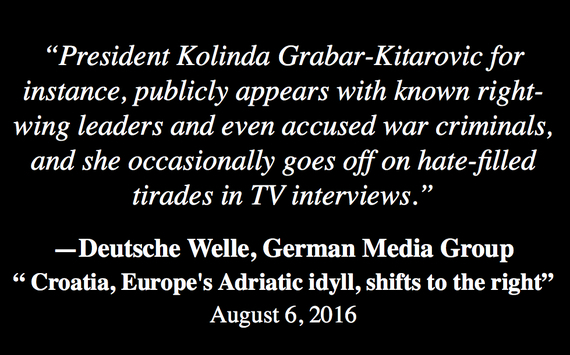 Croatian Jews were outraged by HDZ's historical revisionism campaign. The number of illegal votes on the government's voter list dropped from around 1,000,000 in 2011 to around 300,000 of non-existent voters on the current list (around 9% of the total voters). These numbers suggest that Croatia's politicians who have rotated on the political stage for the last 25 years, and representing Croatia's citizens at home and abroad, in the form of national governments and presidents, have had no legitimacy. Croatia's fraudulent elections reveal a deeply flawed democracy. Croatia's 2011 electoral fraud was brought up in a Written Question to the European Commission by Daniel Hannan, member of the European Parliament from UK, and in BBC's live interview with Stefano Sannino, the European Commission's director general for enlargement. Croatia's former Minister of Administration, Arsen Bauk, finally admitted in May 2012 that in his country of just 4.2 million people, "over 1 million surplus voters" were on the electoral list in 2011 December's parliamentary elections. These illegal votes had a potential to determine more than 70 seats in Croatia's 151-seat parliamentary assembly. According to the study published by Washington D.C.-based Global Financial Integrity in December 2015, $35 billion of illicit financial outflows left Croatia via crime, corruption and tax evasion during the period 2004-2013. This amounts to 60% of the Balkan nation's 2014 GDP. 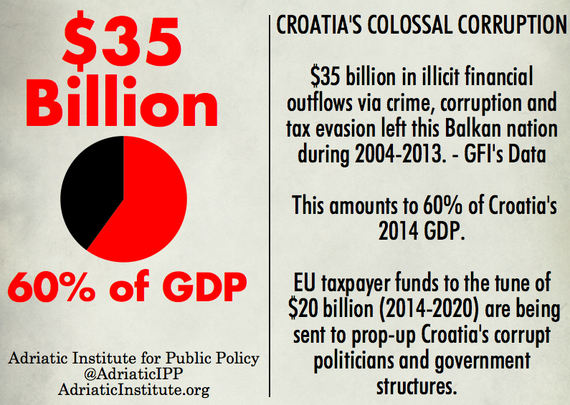 Larger amounts of illicit enrichment have been amassed by Croatia's corrupt politicians and their private partners in crime since 1991. Since Croatia declared its independence in 1991, its two major political groupings have rotated power while politicians enriched themselves. While engaging in rampant corruption, politicians have blocked judicial reforms, interfered with the judiciary, failed to strengthen the rule of law, prosecuted anti-corruption activists and independent voices, encouraged a dysfunctional economy, held fraudulent elections, and brought the government debt down to junk status. As an unreformed NATO member, Croatia's eroded national security is now affecting Europe and the US, through the Balkan Route's illegal immigration, human, drugs, and arms trafficking and terrorism financing. According to the most recent UN report, some $28 billion of illicit heroin and opium is trafficked annually from Afghanistan to Western Europe through the Balkans. On the home front, Croatia's citizens have had their future decided by illegal votes supplanted by a corrupt system. For over 25 years, non-existent voters have been used to cement the nation's daylight robbery and widespread co-existence of organized crime and political corruption. Croatia will continue to have an illegitimate government, illegitimate parliament and the illegitimate office of the presidency until the rule of law is upheld and elections are held with a voter list reflecting the accurate number of voters. Until then, Balkan politicians' interest in safeguarding their illicit enrichment will trump any concern for national security that directly affects its citizens, Europe, Israel and the United States.